Being brave means doing what you need to do even when you are scared. This is what one parent said to her daughter after climbing up a cliff at Lake Mineral Wells State Park. 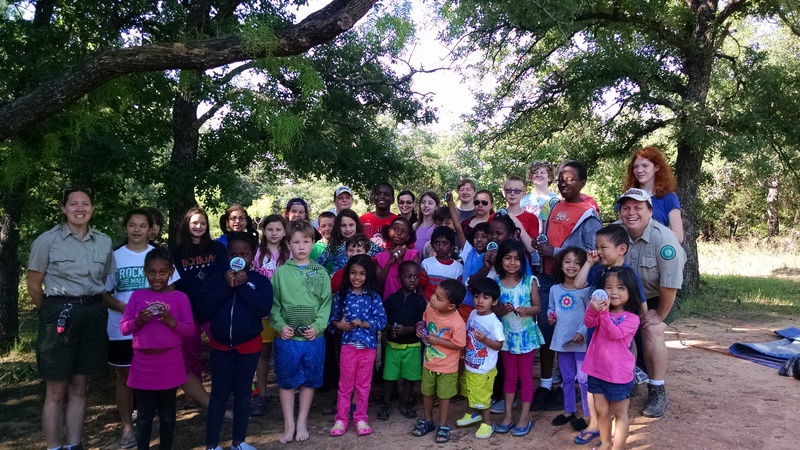 I had the pleasure of being surrounded by brave young souls while volunteering with Texas Outdoor Family. 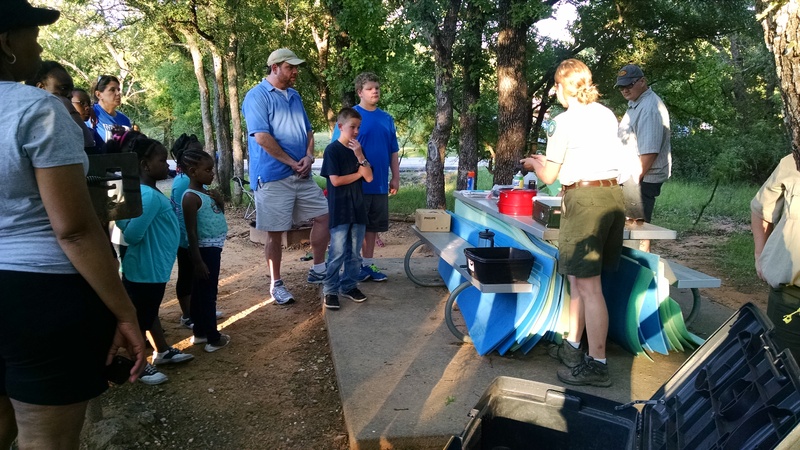 These kids and their parents never cease to amaze me with their bravery and enthusiasm for learning about the great outdoors and park recreation. 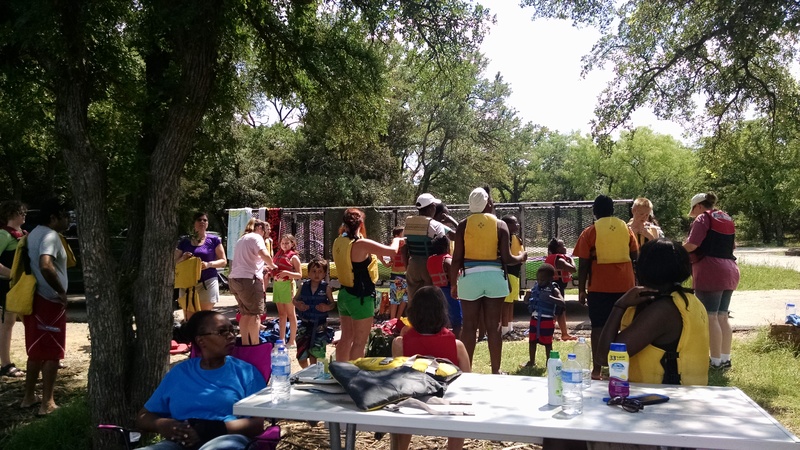 It was an adventure filled weekend with happy kids and proud parents at one of my favorite Texas parks. 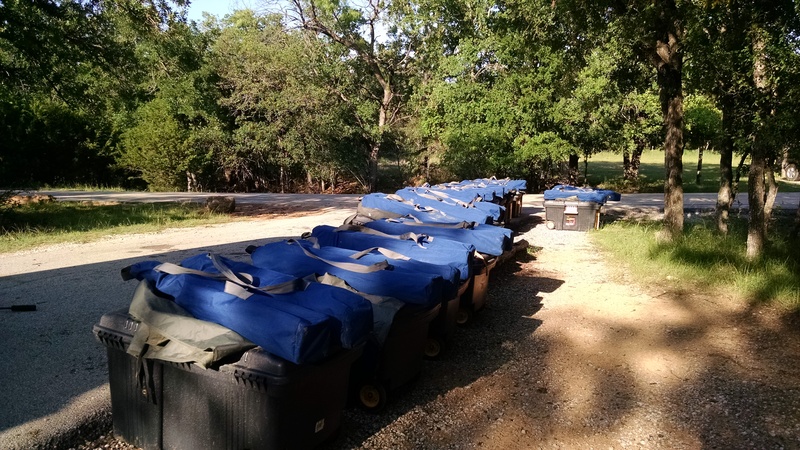 This was my first full weekend volunteering with Texas Outdoor Family. Unloading gear, getting camp set up and teaching the families how to pitch a tent and use the camp stove are fairly simple. 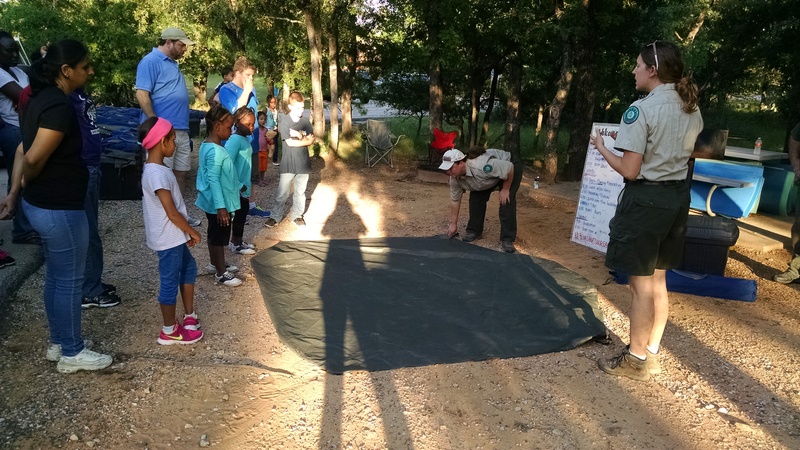 The confusion came from a few families wanting to switch campsites; Ranger Cassie handled it well and got everything sorted out. As soon as it got dark we knew it was about time for bed; that the next day would be a bit chaotic and long with four different activities planned. The sky was clear and no chance of rain in the weekend forecast meant sleeping with the rainflys off and feeling the cool breeze flowing through the tents. It was so peaceful and relaxing to look up at the stars while I quickly drifting off into dreamland. No rainflys also means that you wake with the sun, which with this trip is exactly what we needed. 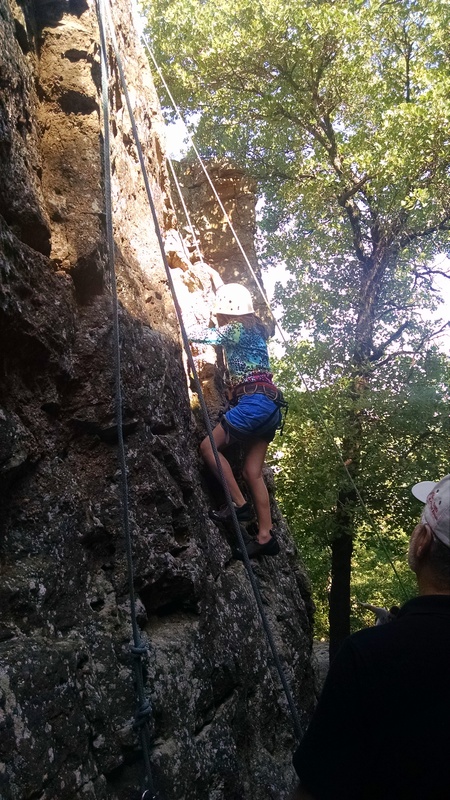 The only activity that required being on time was rock climbing due to having professional teachers come in and instruct our group. We call it being on camp time, when we don’t have a set schedule. Rock climbing was truly amazing to witness and be a part of. I had wanted to climb since rappelling for the first time at this same park two months prior. 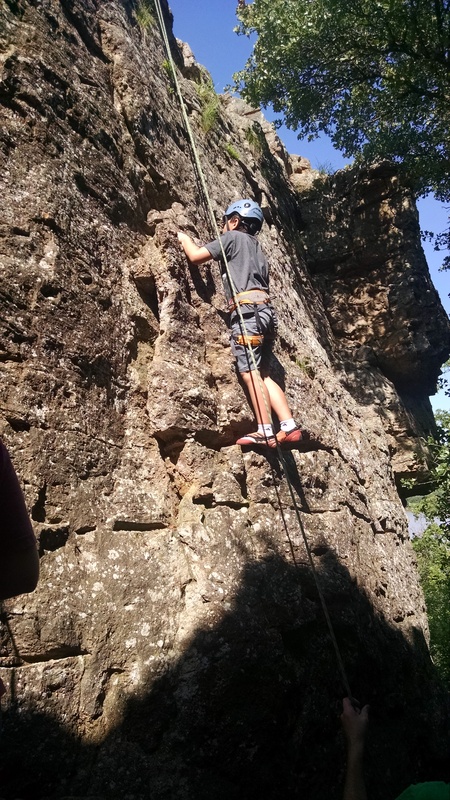 The bravery, motivation and enthusiasm the kids exuded, gave me the push to reach the top. We were all beginners but everyone who tried, did well. 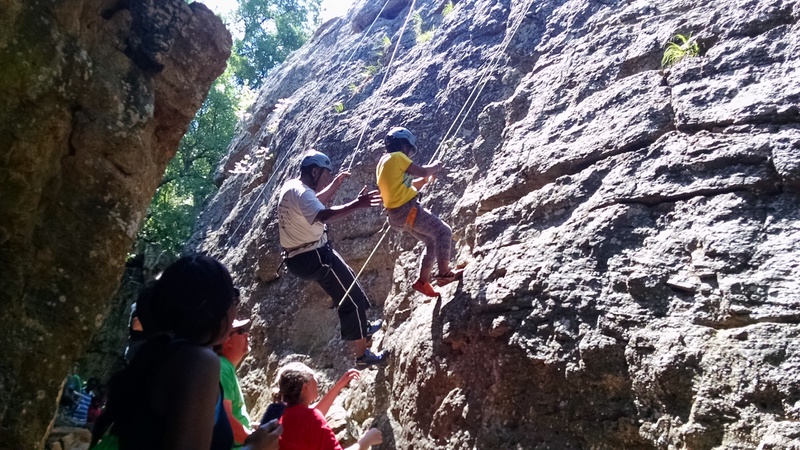 It was more than just learning to rock climb and try something new outdoors, it brought families together. Parents encouraged their kids to try even though they were scared; kids applauded their parents for trying with them. There were cheers, chants, laughs and cries, but everyone survived. 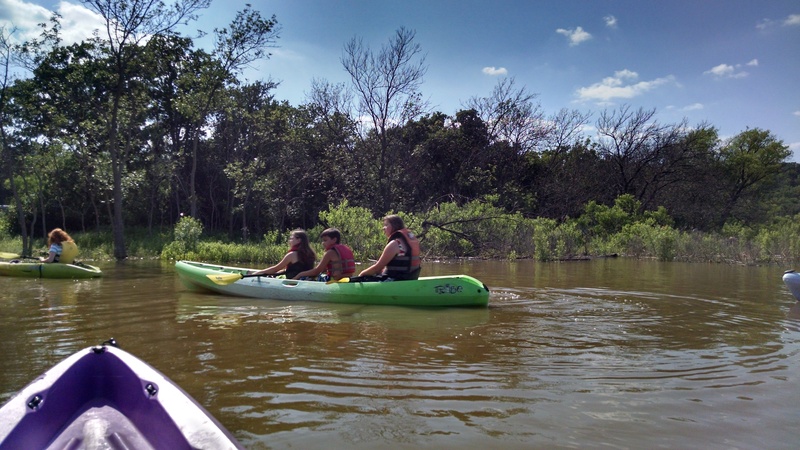 Texas Outdoor Family doesn’t just teach families to camp; it brings them back together in nature without all the worldly distractions that typically distance them. With such a large group, they were split in two so that everyone would have a chance to rock climb. One group would rock climb while the other would geocache then they switched. By the time everyone was finished, it was lunch time and we all needed to refuel. It was a chaotic, adventure filled day, so lunch was really just a quick snack for the rangers and volunteers. Next on the agenda was kayaking and fishing and luckily that short lunch break allowed the families to refuel and regroup. I was expecting a calm, relaxing time out on the water, keeping an eye on our group, making sure they didn’t go too far. Well, it started off without a hitch; however there was one “Kayak Over!” Ranger Lisa paddled to shore with the uncle and his nephew holding onto the back, and I was left to bring in the kayak. I tried several methods and each one failed, then I got smart and clipped the padded seat onto my kayak and paddled away. In this field, you have to think on your feet, and get creative. Not everything runs smoothly, but sometimes the best adventures and memories come from the times where things went wrong. The guys were troopers and even got back on to try again. It was their first time to camp and kayak and they didn’t let the tip over in the lake ruin their feelings of the weekend. After such a long day, it was wonderful to wind down, cool off and eat some delicious camp food. A big thanks to the girl scouts who brought us volunteers and rangers some desserts and camp classics. As tired as I was, my night was not over yet. I had the privilege of doing a ride along with one of the park police officers. I have always had an interest in law enforcement and at this point I was still seriously considering a career as a park police officer. It was great to pick Mr. Kern’s brain and see just a glimpse into what the position entails. Let’s just say, it probably isn’t something I will continue to pursue but I am so grateful for the experience. 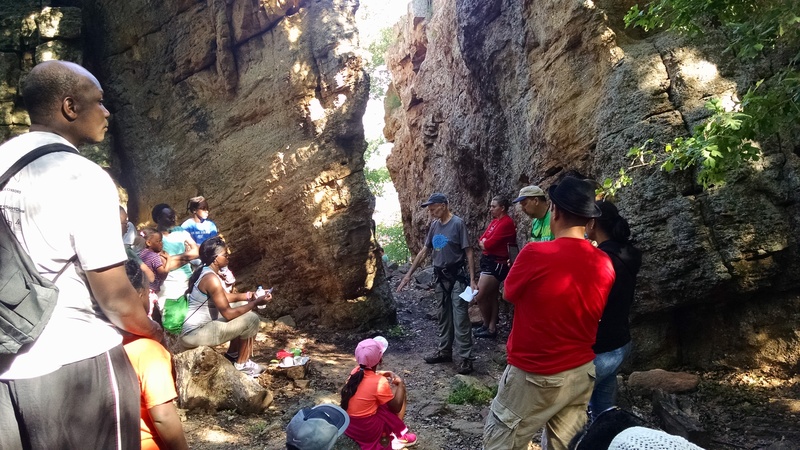 I feel I could handle the work, but during this ride, I realized that my calling was to educate others on natural and cultural resources rather than enforce the laws of the park. It is easy to let doubt and failure dictate our lives, but I learned from these kids at this workshop to keep trying no matter what, to put on your brave face even if you scared. Children can be wise beyond their years, they haven’t been exposed to all the negativity us adults have experienced, and because of that they can teach us to be relentless and carefree. 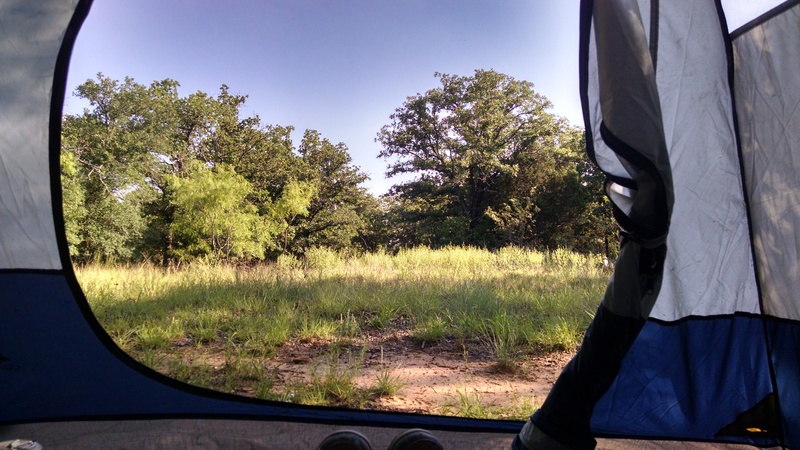 This workshop at Lake Mineral Wells State Park was good for my mind, body and soul. Anytime I can sleep in a tent, get active outside, talk to park rangers, and share my love of nature with others, my heart fills with joy. The weather was beautiful, the company was great, and the memories made will last forever.